My sweet baby girl... she was my walking buddy yesterday. We walked for a solid 55 minutes, and at times I just had to smile at her and her enthusiasm. Out of all my kids, she was the only one who wanted to go to the park with me yesterday... knowing that we were going to walk. And she didn't even complain to the end. 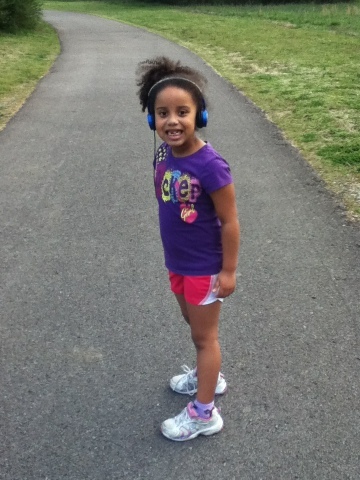 She jogged a little, sang a lot, and looked so cute in her "workout clothes". I look at her, and it reminds me of why this journey is so important. I'm not just doing this for me. I'm doing this for my four children. It is my prayer that my children will never know the pain of morbid obesity. My oldest daughter does struggle with her weight, but her habits are so much better than they used to be. She has been around the same weight for the past 3 years... which is good considering she is 14. Not gaining is good. But she is very active and is now very conscious about what she eats. She will be fine. My nephew is a lean machine and very athletic. When he wrestled and they did a body fat analysis on him, the coach said he had 0% body fat. His mother had the same genes... She's never been over a size 12-14 in her life. My son is not fat, but he is getting pretty thick. He isn't active AT ALL. He eats pretty well, but I need to figure out some way for him to get some physical activity. He will walk with me, which is good. I'm working on him. My kids will be okay... I'm making it my business to make sure they have the right foods to eat. We don't eat fast food, we only have chips and soda on occasion. My kids drink water or Crystal Lite... some juice. They eat fruit and some veggies. I try to stay away from a lot of processed stuff, but I am still guilty of buying some stuff just because it's fast and inexpensive (cold cereal, waffles, etc). I cook for them at least 4 nights per week, and it's a well-rounded meal. When I was a kid drinking Pepsi and eating a bag of Cheetos was normal to me. I could easily eat a box of sugary cereal every day. My kids don't know what that is like, as far was eating those things on an every day basis. And they never will. I want my children to watch my transformation and be proud of me. I want them to know that I am not only doing this for me, but for them, too! You are so inspirational and I'm sure your kids see that. I remember when I started on this journey and I wanted to be healthy and happy on the inside and out for my future babies too. Keep up the amazing work. Your daughter's smile is so gorgeous! Fantastic post! It must be so wonderful sharing that journey towards health with her. And such a cutie she is!!! I am sure she provides so much reason for you to do this! congratulations on your 30 days! i am only 7 days recommitted and i started blogging again- i've been reading your blog on and off now for a few years and i'm so happy to see you're still around working hard. I love that you are healthy both for and with your kids!